Businesses of all kinds are integrating social media into their marketing, but some just have better “social skills” than others. JetBlue is a social media standout because they have a solid grasp on how social media fits into their larger business goals and engagement strategies. They understand that social media can be a valuable communications tool, yet make sure that their social efforts relate to real-world business objectives like ticket sales and customer satisfaction. For a look at how JetBlue has become the gold standard for social media, SalesForceMarketingCloud.com outlined the airline’s five savviest strategies. 1. Know the Brand Mission – JetBlue prides itself on putting people first, so they ensure that their social media efforts stay true to that goal. This translates into making the customer feel valued and supported by maintaining their satisfaction in an open and sincere manner. A prime example was when a passenger tweeted that he was seated next to a beautiful girl yet wasn’t sure if he should talk to her. JetBlue’s social team saw the tweet and instantly responded by cheering him on and encouraging him to strike up a conversation. That kind of support showed that JetBlue took a special interest in their customer’s personal satisfaction, which is the essence of their mission. 2. Keep a Consistent Company Voice – The company voice is the tone of language used in communications and social media requires a more casual, familiar style than usually used in business. JetBlue’s voice expresses their desire to make travel easy and fun, which is an ideal approach because travel can be a stressful experience for many passengers. This light-hearted tone can help reduce some of that tension. JetBlue makes sure to maintain that tone of voice in all of their social communications, including keeping tweets to competitors as friendly and upbeat as those to customers. By keeping their voice consistent, the company comes across as more genuine and their interactions feel more real. 3. 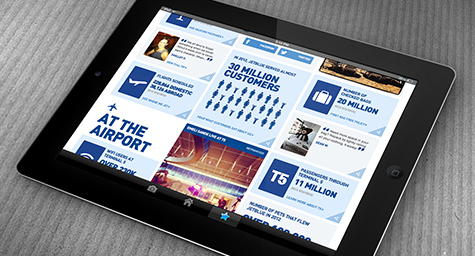 Develop Interesting and Informative Content – JetBlue wants to create content that customers want to read, know, and share. They do this by creating posts filled with compelling and educational information that their customers will find worthwhile. They strive to keep their messages culturally relevant and customer-focused in order to strike a chord with passengers and inspire them to share. 4. Focus on the Fitting Channels – There are many social media networks, but JetBlue wisely limits its social communications to a few select platforms that suit their goals. They use Facebook mostly for sharing content and posting promotions, yet use Twitter mainly for customer service. This strategy lets them choose and use the channels best suited to their messages. 5. Be Open to New Ideas – When more passengers started using Twitter to connect to the company, JetBlue saw an increase in requests to re-book canceled flights. This previously had to be done by phone, but the company quickly realized that one agent could handle many customers at once by processing their requests via Twitter. This decision greatly shortened hold times and showed customers that JetBlue was willing to try something completely new to improve their customer experience. JetBlue has worked hard to earn their reputation as a social superstar. Let them serve as a model of how to plan, produce, and perform social media engagement to keep your business flying high. Use social media to improve your brand image and interactions. Contact MDG Advertising today at 561-338-7797 or visit mdgadvertising.com.